Tyrone Power had proven a talent for comedy in his early acting career. 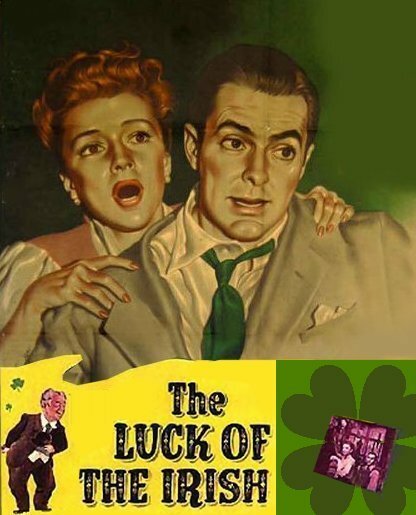 The Luck of the Irish was his first venture into the genre since 1939's Day-Time Wife. The story was based on a novel by Guy and Constance Jones. The character of Nora was originally to have gone to English actress Peggy Cummins. Instead, it went to Anne Baxter, one of Ty's personal favorite leading ladies. The leprechaun was to have been played by Barry Fitzgerald, but, instead went to Cecil Kellaway. The working title for the movie was The Shamrock Touch. The Luck of the Irish was the first Hollywood film to deal with leprechauns. Tyrone Power made several Irish-themed films, including The Luck of the Irish, Untamed, The Long Gray Line, and The Rising of the Moon. New York Herald Tribune: "Tyrone Power eases along in the role of the newspaperman. He is debonair as they come until his new boss makes him write something he does not believe, and the leprechaun turns his gold to stone." Cue: "Tyrone Power, in a complete change of casting, plays with easy charm and a deft sense of comedy."